Spike® Racing defies the physical limits experienced by conventional roller coasters due to gravity. 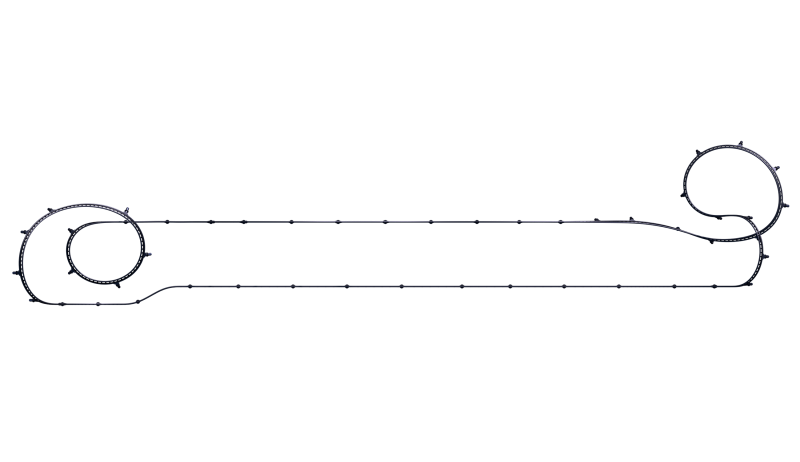 The previous limits imposed by the complex interaction between potential and kinetic energy are completely suspended with Spike®'s driving force. 100% traction allows for propulsion exceeding 1g, allowing for acceleration even on layout segments leading vertically upwards. This is a dream come true for designers and amusement park planners: complete freedom when designing track layouts and ride elements. Energy potential, block braking sections, and necessary straight stretches for propulsion systems no longer play a role for the layout. The sky's the limit — independent of physics and technology. This is a dream come true for designers and amusement park planners: complete freedom when designing track layouts and ride elements. The unlimited energy reservoir transforms even flat stretches into a special attraction. Closely adapting to the terrain or navigating tight corridors between buildings, an outstanding track height loses its meaning. With the massive power of the Spike® drive constantly available, the vehicle is accelerated out of a steep curve while still in the radius, giving a sensation never experienced before. Power and dynamics are felt along the entire route with all five senses, and the intensity and fascination only end when the ride does. Tight radii, up to 3 m horizontally and 5 m vertically, are possible at any point in the layout. The speed of the vehicle is adapted while on the move by the control system, ensuring that predetermined lateral or compressive forces are not exceeded. 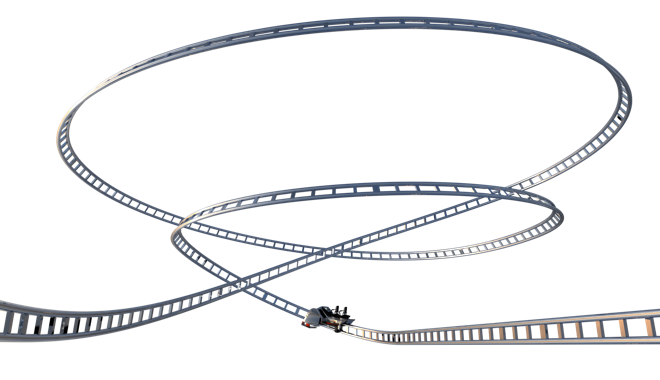 Unusual and unique track shapes ensure that every Spike® coaster is unmistakable, and open up a whole world of possibilities for roller coaster construction. Designers can truly give their creativity free rein when designing new, innovative track shapes. 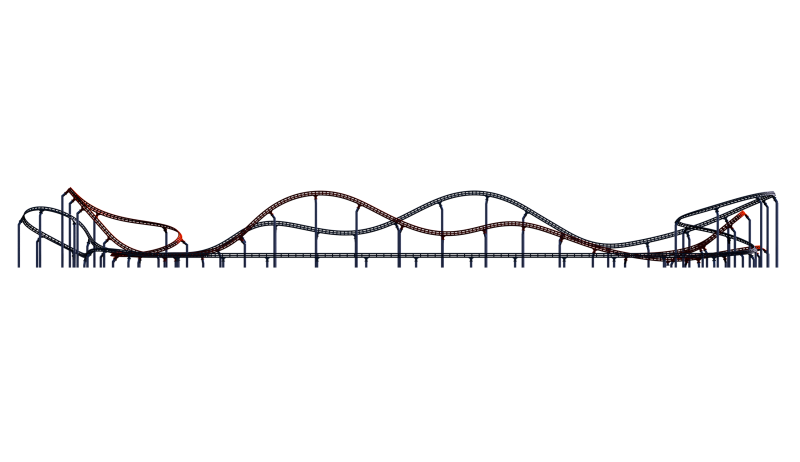 Decelerating for the small radius in the middle of the figure, only to thrust off again with full acceleration over the steeply banking tight curve of the ride element. Closely intertwined with constantly interweaving tracks, this ride figure provides a breathtaking series of bends in an extremely tight space: The carousel, re-imagined. 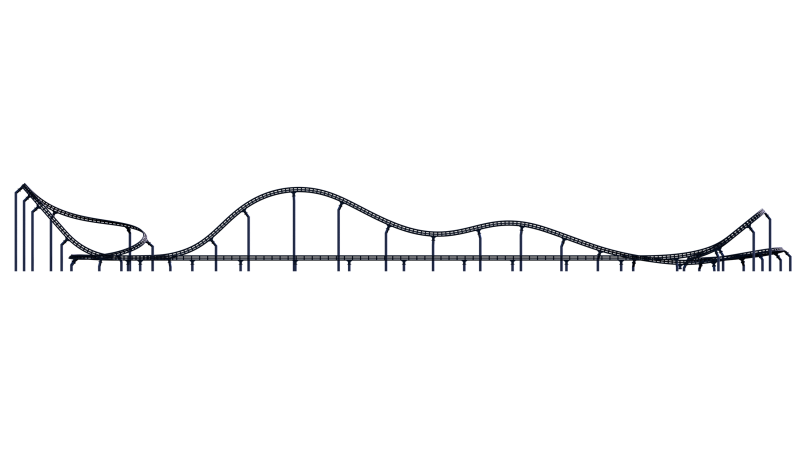 Passengers accelerate up a widening corkscrew with increasing velocity to an astonishing height, before speeding down along a wide curve. Each Spike® vehicle is equipped with its own decentralized safety control system, via which all relevant data is constantly exchanged with the central control system and those of the other vehicles. This allows vehicles to be located down to the centimeter and speeds and acceleration to be regulated precisely every step of the way - tooth by tooth. The form-locking and hence weather-insensitive safety braking system, which is integrated into the vehicle, allows for short vehicle cycle times and dispatch times of less than 5 seconds. During this process, the integrated dynamic block control system continuously ensures that the necessary safety clearances are observed. Hence, even when using single two-seater vehicles, capacities of 1000 pph can be achieved. The form-locking and hence weather-insensitive safety braking system, which is integrated into the vehicle, allows for short vehicle cycle times and dispatch times. An attractive side effect is a hitherto unsurpassed number of vehicles which are traveling concurrently and which make the installation appear exciting and full of new adventures from the outside. Because the vehicles are freely controllable, it allows for unusual ride experiences such as traveling forwards and backwards, short, exciting stops, and the easy integration of show areas. 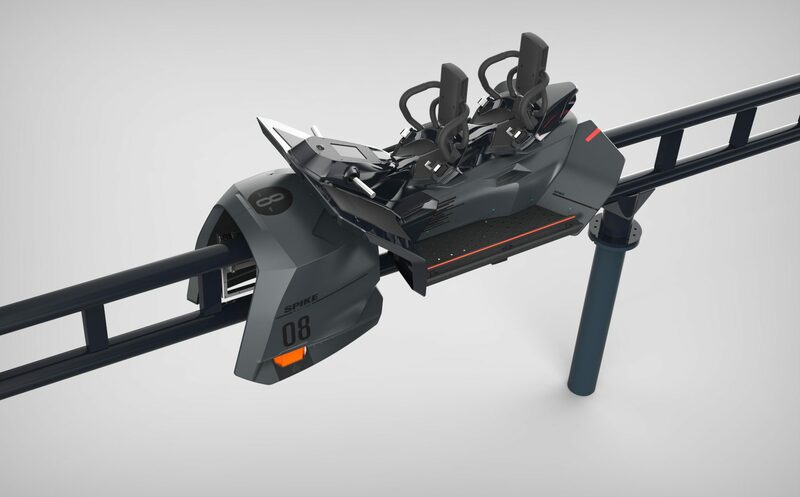 Spike® turns roller coasters into a sporting vehicle as well as a real-life computer game experience. Comparisons with other drivers and the incentive to learn to better master the equipment in order to get even faster and push the limits fan the fires of competition. Active driving is necessary, and turns the ride into an unforgettable experience, both for lone drivers as well as group events. Simple integration of operating elements such as a throttle, brake, and boost button, as well as a display which indicates the speed, acceleration, virtual tank fill level etc. The speed range within which drivers are able to ride their vehicle has been pre-programmed for each particular track layout. The predetermined minimum route speed ensures a reliable transportation capacity, while at the same time ensuring a suitably fun experience even for beginners with a careful driving style. Simply going at top speed without braking at the right time before a bend leads to a loss of time, such that it is primarily training, intuition and courage which decide who gets the best times. Additional game elements which participants will be familiar with from video games, such as boosters, tank fills and even attacking other players, can also be integrated as optional extras, further augmenting the experience. The integrated, fully-fledged safety control system allows for the simple integration of operating elements such as a throttle, brake, and boost button, as well as a display which indicates the speed, acceleration, virtual tank fill level etc. The pre-selection of electronically generated, speed-dependent vehicle sounds ranging from the deep roaring of a large motorbike engine to futuristic spaceship sounds are also possible, as are automatic on-board video recordings for the passenger. Maximum riding comfort and an unparalleled feeling of freedom are achieved via the patented belt retaining system. Optimal accessibility of the control elements for all body sizes is ensured by the motorbike seat used in the Spike® Race, Bike Race, and Air Race vehicles. Maximum riding comfort and an unparalleled feeling of freedom are achieved via the patented belt retaining system, in which a hip belt is all that is needed for full personal safety. The retaining system fulfills the highest safety standards and is certified by TÜV Süd. Furthermore, the innovative belt material reliably protects against vandalism, dirt, and moisture. Spike® Race offers an interactive ride experience that makes it possible for anyone to experience the rush of action sports without any risk. Feeling the brute force of over 1000 Nm of torque is one thing, but turning the throttle to intentionally accelerate with over 1 g — as fast as a Formula 1 race car — is a completely different sensation. In addition, there is also the lowest seat position ever implemented in a roller coaster, the rail between your legs, and a feeling of freedom akin to being on a motorbike, limited only by a hip belt. You can't experience speed any more intensively. 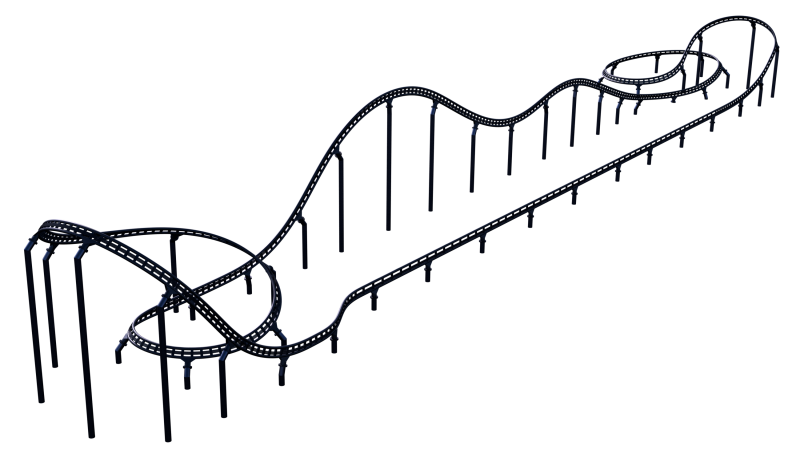 Maximum inclines, accelerating out of curves and many unique track figures offer a ride never experienced before. A throttle and boost button for additional thrust, brake lamps that light up, speed-dependent, freely configurable ride sounds, on-board video and a touchscreen display — you can't squeeze any more equipment in — make the Spike Race car a high- tech vehicle that is unrivaled in its class. Design creates authenticity. During the designing of the Bike Race vehicle, the focus was on achieving an authentic reproduction of a real motorbike down to the last detail — and even the inclusion of original components. The hip belt safety device allows riders to experience the freedom of a real ride on a motorbike, but it is the extreme power of the drive unit and uncompromising track layout design that enhances the experience far beyond what they have ever experienced before. During the designing of the Bike Race vehicle, the focus was on achieving an authentic reproduction of a real motorbike down to the last detail. The platform of the four-seater Bike Race has a modular design. It therefore also allows the vehicle to be adapted to other configurations. In addition to the construction of manufacturer- and type-specific special motorbike variants, it allows e.g. authentic car replicas and historical designs to be created. 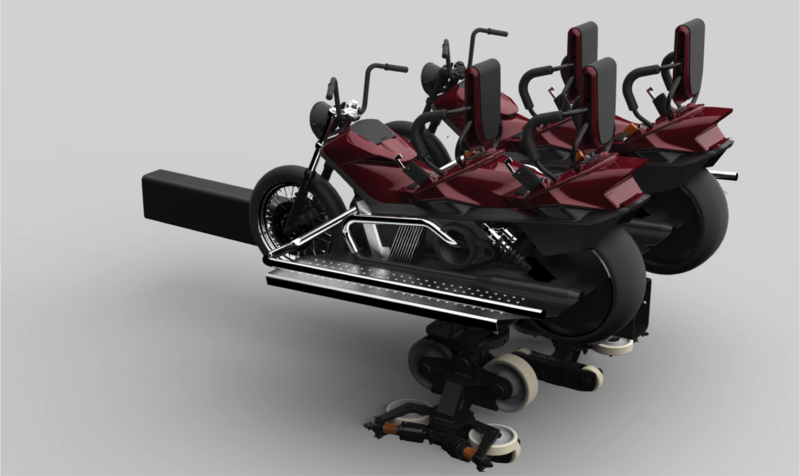 The ride of the powered racer is fully programmable, and additional equipment can be integrated as needed. Furthermore, the interactive speed control is not only limited to two-seater versions, but can e.g. also be provided to other passengers after a changeover at a point on the route. 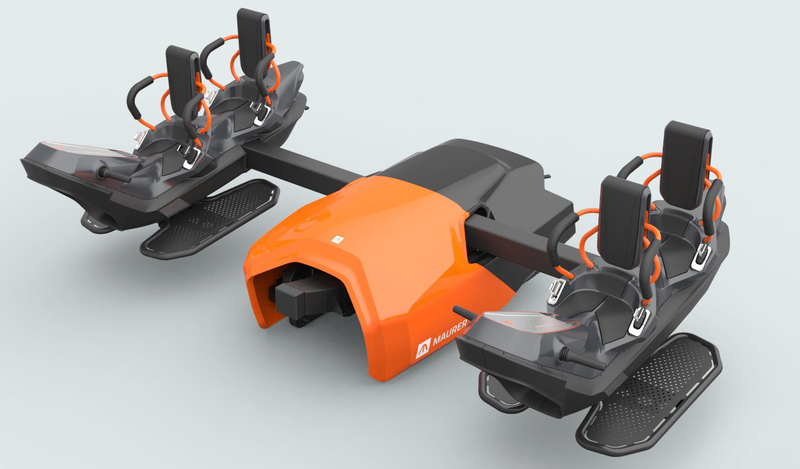 Air Race is a wing coaster vehicle for 2 x 2 passengers, with one group sitting behind the other. Limitless fun on rides and an unbeatable feeling of being in flight are guaranteed. Only the hip belt prevents passengers from actually taking off. This extraordinary ride is perfect for artificial flight and aerial races, but also for use in stories that would otherwise be impossible to theme, such as a ride on a dragon or a witches ‘broom, a hoverbike, or a fantasy bird. Limitless fun on rides and an unbeatable feeling of being in flight are guaranteed. As a powered Spike® system, Air Race fulfills the highest capacity requirements with its short launch times. The vehicles continue moving slowly while passengers get on and off from either side, thereby minimizing the length of the station. Exact control of the vehicles replaces all station drives, additional sensors, and other built-in rail structures. The overall systems remains simple. In the same manner, sudden speed changes can be programmed at any location during the ride without any technical effort, allowing any story to be turned into a breathtaking adventure. 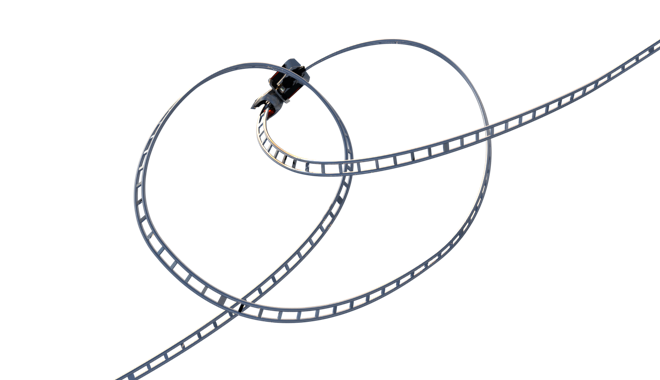 Single Dragster is a standard Spike® Race coaster, specially developed as an interactive attraction for smaller parks. The driving time is recorded and entered into a high score list with daily and all-time records. Dueling Dragster is the Spike® competition standard. 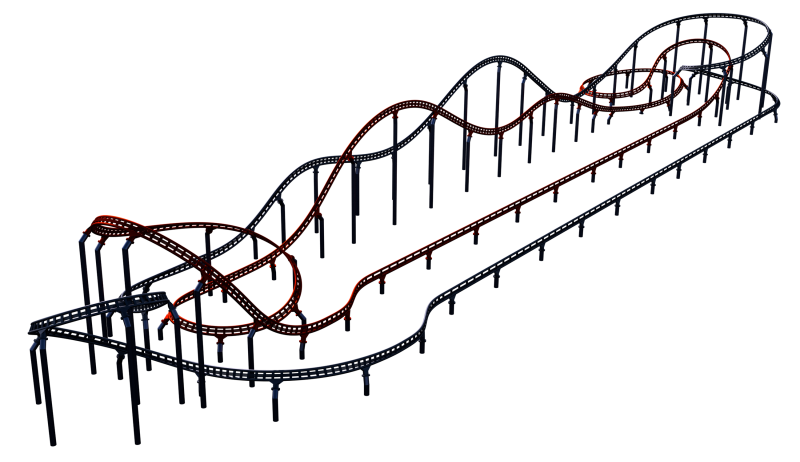 Because the first route is constructed identically to the Single Dragster, the second route can also be added at a later point in time. A simultaneous start on the right and left tracks, a total of eight track crossovers, as well as approx. 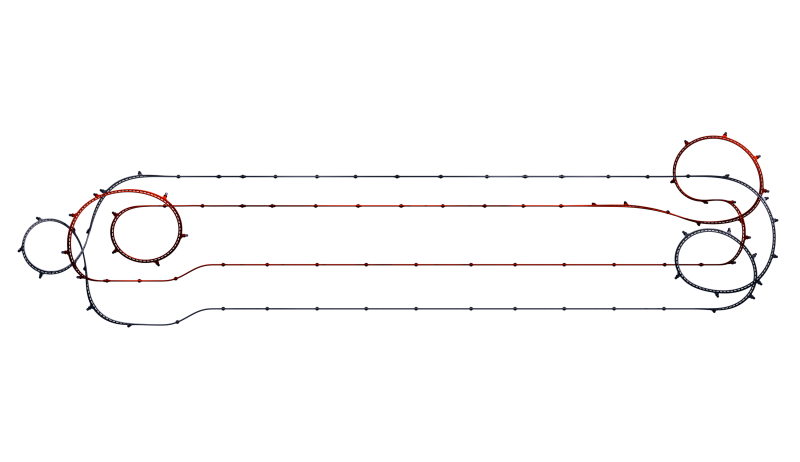 half the ride on parallel tracks allow head-to-head racing and direct comparisons with each other. The routes have the exact same speed, but pose different demands for the drivers, such that a rematch is inevitable at the end of the race. Furthermore, the high score list allows for comparisons with other drivers — even between Spike® Dragsters at different amusement parks. The characteristic double camelback visible from afar is a clear identifying characteristic of this challenging racing experience. With a route that can be planned practically without any restrictions, the term custom-designed takes on an entirely new meaning, allowing all of the wishes and requests in the customer's design to be implemented exactly as envisioned. 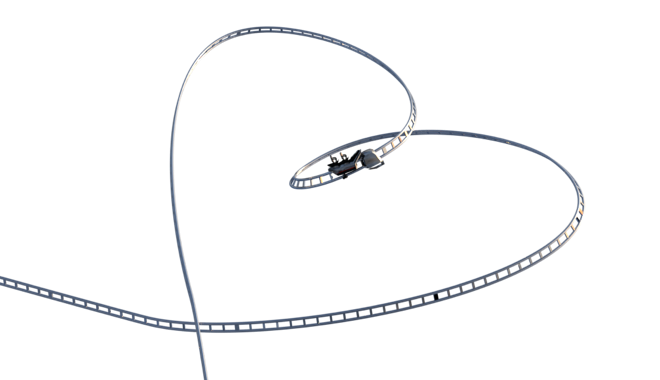 Never before has it been possible to adapt track layouts so exactly to the requirements of each particular project, allowing them to be turned into unique attractions while fulfilling so many aspects at once. Interactive sections can alternate with automatically controlled sections. Encounters between the vehicles are just as easy to configure as the variations between slow and high-speed trips. Hence, it is not only the pre-show but the entire installation which becomes part of the story told, with climax after climax, and suspense, surprise, and overwhelming impressions create a truly unique experience. The term custom-designed takes on an entirely new meaning, allowing all of the wishes and requests in the customer's design to be implemented exactly as envisioned. Explore a mystical mountain landscape with a snowmobile while traversing ravines and caves. During this adventure, the passenger controls the speed and acceleration, thereby adapting the experience to his needs. After fleeing from pursuers at full speed, passengers chance upon a panoramic route with unexpected scenery, right before the tracks take a sharp turn and plunge into the depths of the mountain. This is just one of an infinite number of stories that can be realized both technically and in an economically feasible manner with Spike®.